We have a busy workshop staffed by locals and by volunteers from around the World. 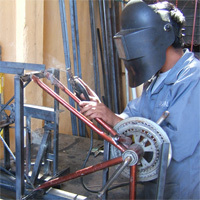 As well as building Bicimaquinas, we offer a bike repair service and sell used bikes in the surrounding area. We also work with a number of local partners, NGO's, agricultural cooperatives and organic producers. We are supported by a number of international organizations and accept volunteers with a range of skills and interests. We are in the process of making our designs available globally, via downloadable fact sheets and step by step instructions. We aim to be a center of pedal power research and development and an information resource for NGO's promoting appropriate technology and small scale, sustainable agriculture. 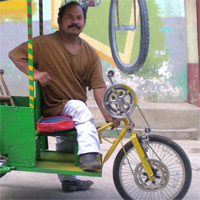 We began in 1997, working with a group of Canadians from the organization PEDAL. 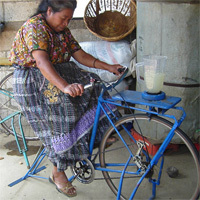 Following a vision for sustainable development in Guatemala, we became constituted under local control as Asociación Maya Pedal in 2001. "The Curry Stone Design Prize honors an individual or group for developing and implementing a visionary design innovation. These emerging projects address critical issues such as access to clean air, food and water, shelter, health care, energy, education, social justice and the promotion of peace."